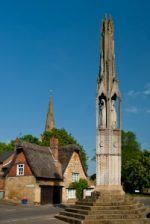 The Covington History Group is planning a visit to Queen Eleanor Cross and Church in Geddington one weekday in early June. This is an English Heritage site and we will be escorted around the site by a guide. This will be followed by lunch at a local pub. You can find out more from the English Heritage website here. Please contact Richard Brown for further information, either directly or via the Contact form below. The stately triangular Geddington cross, with its canopied statues surmounted by a slender hexagonal pinnacle, is the best-preserved of only three intact survivors.